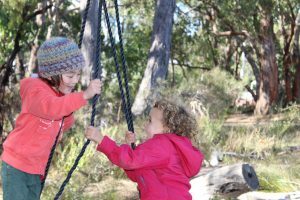 Bush School at Upper Sturt Primary School means children learn how to enjoy living in and caring for our natural environment whether in the bush or at the beach. We have created spaces that are aesthetically appealing and harmonious with our natural world with a greater emphasis on the learning flowing between inside and outside, and beyond. The Food Forest enhances children’s understanding in sustainable and organic survival where all students undertake daily routines of recycling, composting and litter control. Tjirbruke (fire-pit area) is currently a regular meeting place where we share stories, sing and learn about risk assessments and safety. It is a place where we not only light fires but ignite minds. Just up the path into the heritage bush is the Story Telling Chair (carved from a tree stump) surrounded by natural wood benches. 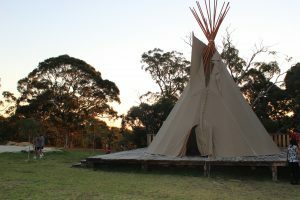 This space is perfect to sit and read or hear an oral story nestled between the tall gum trees. A walk through the grounds also reveals the hidden fairy toadstool table and seats, amphitheatre with rock seating, mud kitchen, and colonial cottage, just to name a few.